I love the Big Island of Hawaii because it so diverse. Several weeks ago I traveled with my husband and my father to meet up with my brother and his wife on this tropical island. I have been there a few times before, but this time was different since so much of my own family was there. I love the Big Island because it so diverse. One minute you can be in a lush tropical rainforest, and the next you feel like you are on a different planet because of all the dried lava flow from days gone by. The Big Island is the newest of the islands in Hawaii, and it is still under construction . My brother asked me what I wanted to do, and I told him I wanted to go to the Hawaii Volcanoes National Park and to see the lava tube, since I had somehow missed it on prior visits. So five of us ventured in a jeep two hours from Kona to see the land of the volcanoes. Other than my brothers driving, which was pretty scary in and of itself (he drives very fast), we enjoyed the windy roads and spectacular views from a few thousand feet up. Somehow we made it safely to the park. There is a visitor's center there which has many informative displays as well as a video to preview before you go out on your own. The video basically told you how dangerous it was out there, and that you were responsible for your own safety - and then it said to have a great day ! It showed how the shelves that are formed when the lava pours down the mountain can give way and you can disappear.You can also die from the exposure to volcanic gases (VOG). Oh, great! The video also showed how paved roads and houses have been swallowed up by the hot molten lava, and in fact, a whole village that was in the path of the lava no longer exists. 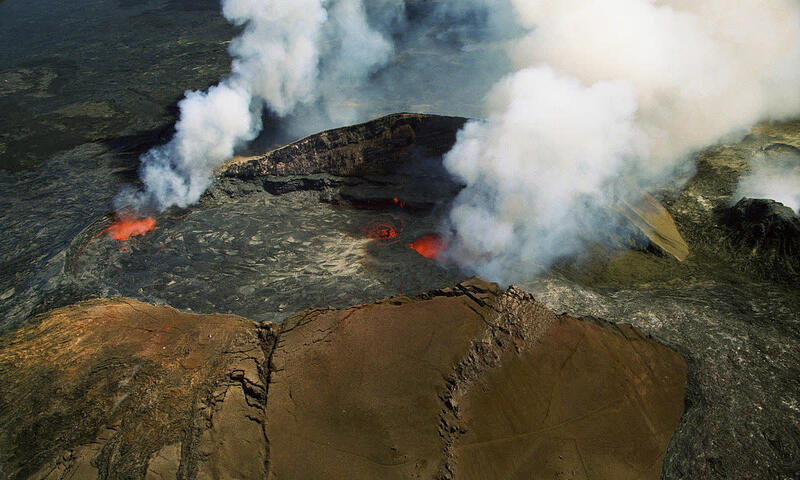 In 1990 lava buried 43 square miles of land including over 200 homes, and the entire town of Kalapana. I guess if Madam Pele (the volcano Goddess) has travel plans, you better get out of her way. So, armed with this information, and realizing we were surrounded by vents that spewed steam from the hot lava flowing deep beneath our very feet, we explored the territory. 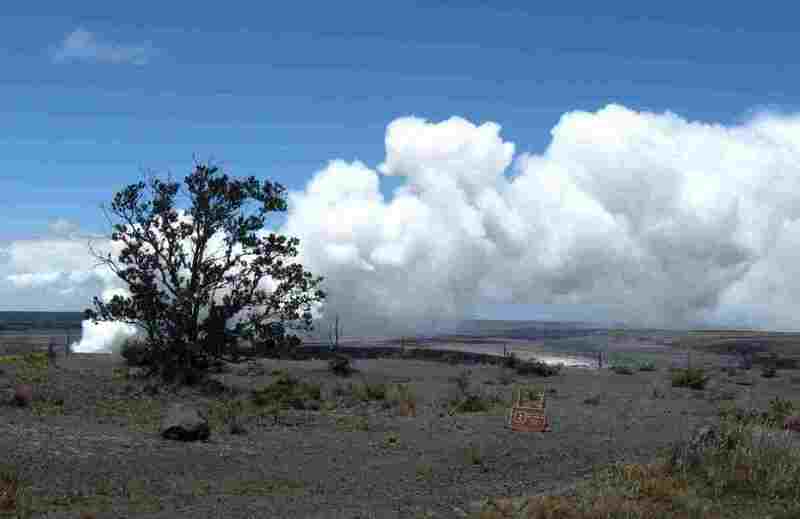 I was a bit jumpy the rest of the trip, and especially when we looked out over the caldera and current site of the Kilauea volcano where there were big clouds of volcanic gases bellowing out. Then we decided to get even more brave and go to the underground Thurston Lava Tube. It was very interesting as you can see by the video. I half expected some lava to come thru the tube and get us, but it didn't. We survived our trip to the Volcanoes Park, but since we left, Kilauea decided to show her fury, and it has been on the national news quite a bit since then. Here are some pictures from last week - March 2011. Due to the latest activity, the Hawaii Volcanoes National Park has closed a number of roads and trails. Kulanaokuaiki campground was also closed until further notice. Luckily, no homes are under threat. I am glad we got to see it when we did - I remember seeing the campground they are talking about. 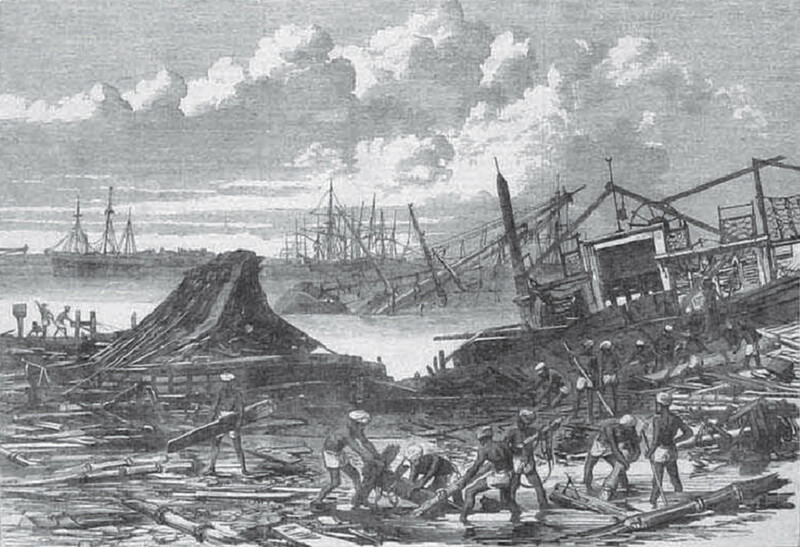 Earthquake or Cyclone: What Destroyed Calcutta in 1737? You are very fortunate - wish I had been so lucky. It is sad that a whole town was destroyed by the volcano. That is a treasure you have for sure! Thanks Danielle for your comments. When I visited Hawaii in 1988, one of my missions was to find and photograph Kalapana beach with its black sand. I had bought a wax-crayon drawing of the beach from an artist friend who loved the place, and I decided to bring back a photo for Laura Lee of the scene she had rendered, with its palm trees blowing over the black cliffs to the ocean spray. I did take that photo from the same vantage, lingered on the beach sifting the black sand through my hands, then visited the town, sat in that irreplaceable little painted church whose walls were covered with colorful artwork. In 1990, back in New York State, when I heard the news that Kalapana had been destroyed, I was heartbroken. And also grateful I'd had a chance to experience it - one dream not deferred. Laura Lee's drawing and the enlarged photograph hang near each other in places of honor in my Hudson Valley living room. Thank you Cindy2011. I appreciate your addition to the hub. You are right about who is in control. Definitely not us. Thanks for sharing your story. For me it jogs my memory, as I visited the area and the lave tube some years ago. I was amazed at the number of people who ventured so close to the volcanic activity. Just where we stood to observe, the ground below our feet was very hot. We were behind the tagged safe boundary. It certainly reminds us of who is in control of the planet. What a beautiful place though - you're fortunate to have it so close. Great article. Glad you liked it SUSANJK. Volcanoes are exciting and hot. Thanks for your comments. Love these pictures. It must have been so exciting taking them. Yes, exciting and dangerous. Glad you enjoyed it Beth. Thanks for your comments. WOW, How exciting! Loved the pics. I always wanted to visit Hawaii after reading James Mitchners book. So much history and beauty! Great hub. Thank you for your comments Danielle. Sounds like you were up close and personal with Madame Pele. Glad you were not hurt. It is a humbling and remarkable experience when you face hot molten lava. 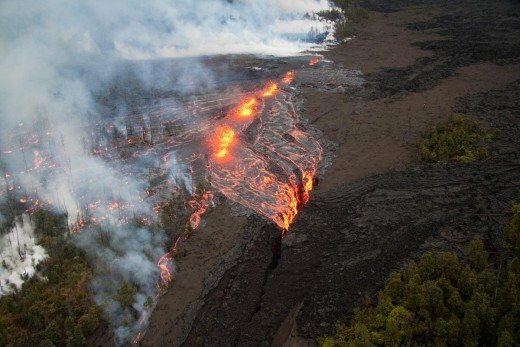 Thanks for this Hub about Kilauea. I went to Hawaii about 25 years ago and spent most of my time on the Big Island. I felt Pele's presence everywhere. 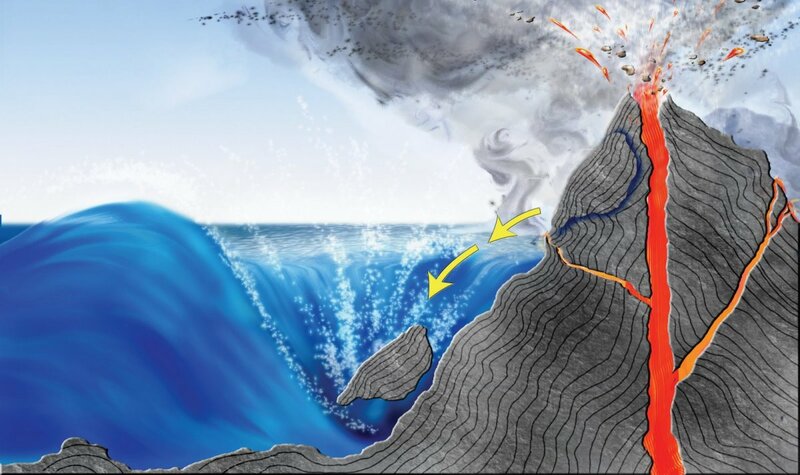 About a month before, Kilauea had had a big eruption--Chain of Craters Road was closed off by the lava, with pockets of orange-red glowing just beneath the hardened surface -- and she was still active. I stood on the hardened lava flow one evening, with just a couple of other people, the soles of my sneakers feeling like they were starting to melt, and watched a new stream of molten lava coming in our direction from miles away, engulfing trees in its path. It was an unforgettable experience of nature's power and beauty. Will look forward to reading more about your wonderful island home. I'll have to check that out morriscode. Thanks for your input, and yes, it is exciting and fascinating. Thanks HealthyHanna. Yes, it is! Volcanoes are impressive - and dangerous. Thanks for commenting. I'm a Big Island fan too. One of the best blogs I've found that totally covers all the islands with photos and commentary is www.trailblazerhawaii.com. Pretty exciting stuff going on right now! Me too, Jake. I hope you can visit the Big Island. It is great! Glad you enjoyed it crystolite. That wasfascinating and you were brave. Nothing would have got me through that even I would have dying to see it. I was thinking of you when I read about the new activities. I hope nobody gets hurt. So awesome. 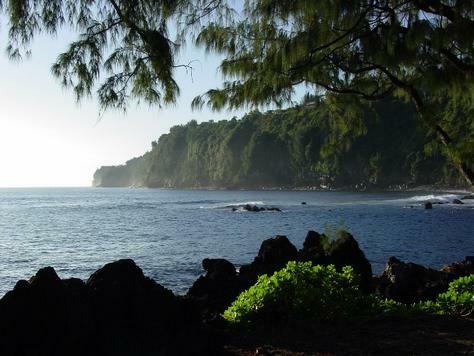 I hope to get visit the big island one of these days! Thanks so much thoughtforce. It is fascinating to see the power of nature - and very humbling (to think you could be melted in an instant if you get too close). Glad you enjoyed it. The photos and the video are amazing! Imagine visit a volcanoes park. 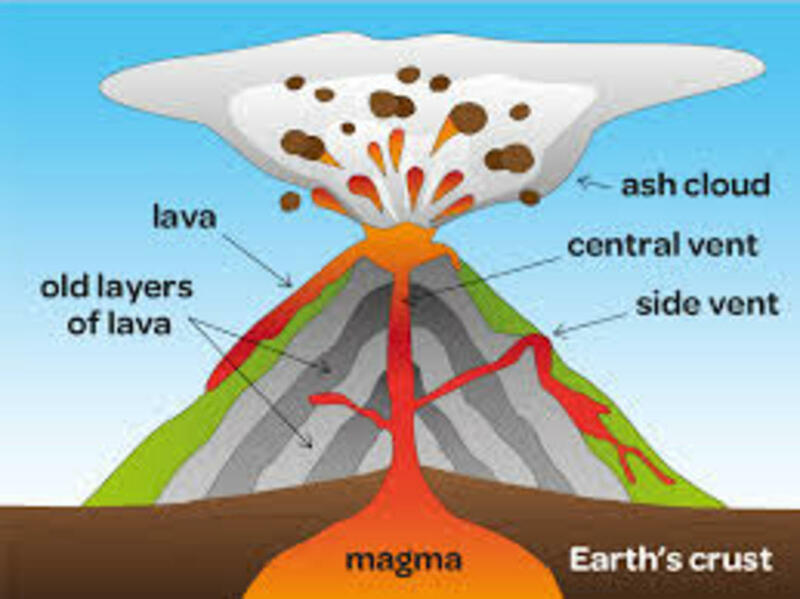 To be near a volcano is to be near Earths power which is fascinating. Thanks for sharing your visit and the latest news! Rated up! Thanks for the positive comments y'all. The volcano continues to erupt, even today, and they have no idea what it might do next. We sure know who is boss here - mother nature. She must have PMS. Beautiful, fascinating and scary all at the same time! 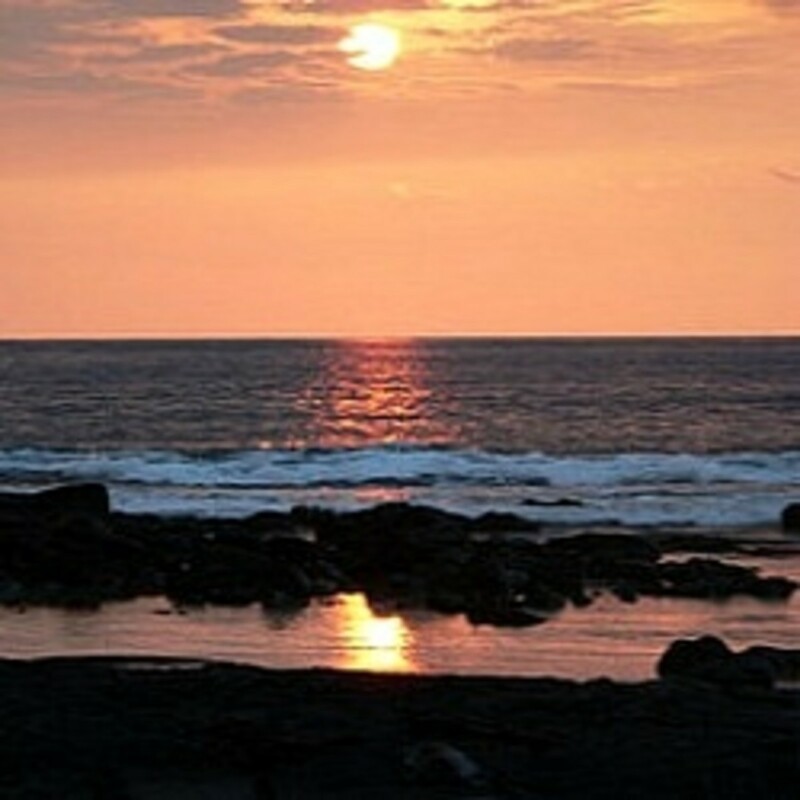 Thank you for sharing this information about the beauties of the Big Island of Hawaii. So interesting! A great hub and i was griped all through. Pictures video clips all complemented the final product. Thank you Youngcurves. 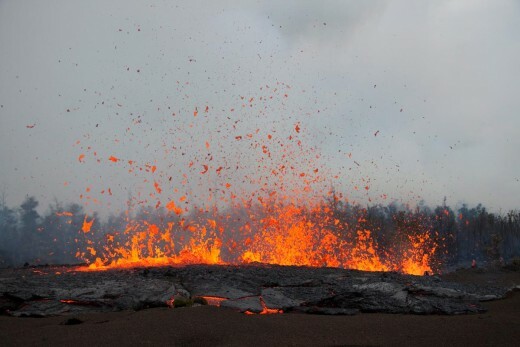 Mother nature always has surprises for us, and Madam Pele helps her out. I appreciate your comments. diogenes: Oh, wow, I will have to check out the volcano in Mexico. Sounds pretty scary. Thanks for the information. Thanks breakfastpop. I do think it is amazing. Fascinating... but when is it all going to blow up? Weren't you scared? What an amazing display of nature's fury.